Houghton Mifflin Harcourt, 9780544952560, 272pp. Physician and popular New York Times Upshot contributor Aaron Carroll mines the latest evidence to show that many “bad” ingredients actually aren’t unhealthy, and in some cases are essential to our well-being. ·Eat red meat several times a week: The health effects are negligible for most people, and actually positive if you're 65 or older. ·Have a drink or two a day: As long as it's in moderation, it will protect you against cardiovascular disease without much risk. ·Enjoy a gluten-loaded bagel from time to time: It has less fat and sugar, fewer calories, and more fiber than a gluten-free one. ·Eat more salt: If your blood pressure is normal, you should be more worried about getting too little sodium than having too much. Full of counterintuitive lessons about food we hate to love, The Bad Food Bible is for anyone who wants to forge eating habits that are sensible, sustainable, and occasionally indulgent. Dr. Aaron Carroll is a Professor of Pediatrics and Associate Dean for Research Mentoring at Indiana University’s School of Medicine, and Director of the Center for Pediatric and Adolescent Comparative Effectiveness Research. His research focuses on the study of information technology to improve pediatric care, health care policy, and health care reform. In addition to his scholarly activities, he has written about health, research, and policy for CNN, Bloomberg News, the JAMA Forum, and the Wall Street Journal. He has co-authored three popular books debunking medical myths, has a popular YouTube show called Healthcare Triage, and is a regular contributor to the New York Times’ The Upshot. Nina Teicholz is an investigative journalist and author of the International (and New York Times) bestseller The Big Fat Surprise. The Economist named it a top science book of 2014, and it was also named a 2014 “Best Book” by the Wall Street Journal, Forbes, Mother Jones, and Library Journal. Before taking a deep dive into researching nutrition science, Teicholz was a reporter for National Public Radio and also contributed to many publications, including the Wall Street Journal,the New York Times, the Washington Post, The New Yorker, and the Economist. She attended Yale and Stanford where she studied biology and majored in American Studies. She has a master’s degree from Oxford University and served as associate director of the Center for Globalization and Sustainable Development at Columbia University. She lives in New York City. One of iBooks' "2017 Favorites"
"The Bad Food Bible knocks down a number of nutrition myths...[Carroll] closes the book with nine common-sense rules for healthy eating." "In this informative, accessible book, Carroll, a doctor and healthcare expert, sifts through the research, advice, and straight-up hype surrounding diets to reveal that some of the foods we view as off-limits aren't as awful as we think...The book has plenty of sensible tips for maintaining a healthy diet...Here's to a delicious new year!" "This excellent title from Carroll explains that practically no food or drink is as bad as certain 'studies show' data would have us believe...VERDICT: An excellent choice for every reader and all collections." "'Avoid gluten!' 'Eat organic!' 'Go vegan!' The cacophony of dietary doctrine has reached a fever pitch. Aaron Carroll—a pediatrics professor and a seasoned health columnist—analyzes countless nutritional studies and concludes that many of society’s frowned-upon foods are unfairly demonized. From the crusade against butter to our vehement disdain for genetically modified foods, Carroll uses historical examples and rarely published scientific evidence to help us see through the current pandemonium. His commonsense approach lays the groundwork for a healthy relationship with 'sinful' foods; the only commandment in The Bad Food Bible is moderation." “Eat, drink and relax, already. As Aaron Carroll shows in The Bad Food Bible, when it comes to nutritional health, much of what we've been told to worry about is either hyped or hogwash." 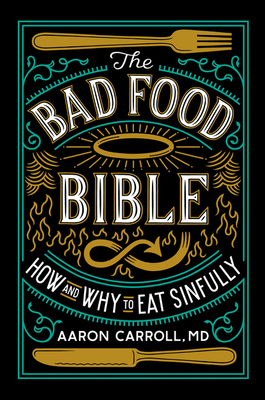 "In The Bad Food Bible, Aaron Carroll turns down the food fear sirens to zero, and responsibly explains what science actually says about the food we eat. Instead of demonizing prosciutto or wine, Carroll reminds us that the odd indulgence isn't going to kill anyone, but a lifetime of poor nutrition might —sane and welcome advice in a time of great nutrition confusion."